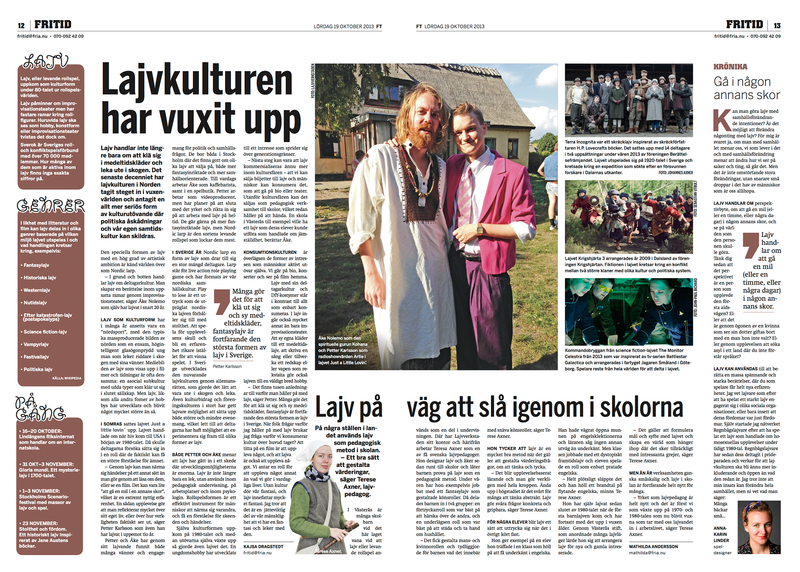 Me and my friend Åke was interviewed in the weekend edition of Fria Tidningen about how larp culture has grown up and why we larp. The larp Just a Little Lovin’ is featured as well as some images from Terra Incognita, The Monitor Celestra and Krigshjärta (Heart of War). When people ask why I’m am larping I usually ask why we consume culture at all? Watching a movie is to experience something. To larp is also to experience something. We assume a role to experience something other than what we do in everyday life. Without culture our imagination dies, and larp involves a lot of imagination. I think that it is a very important part of our humanity that we have imagination and play with it.